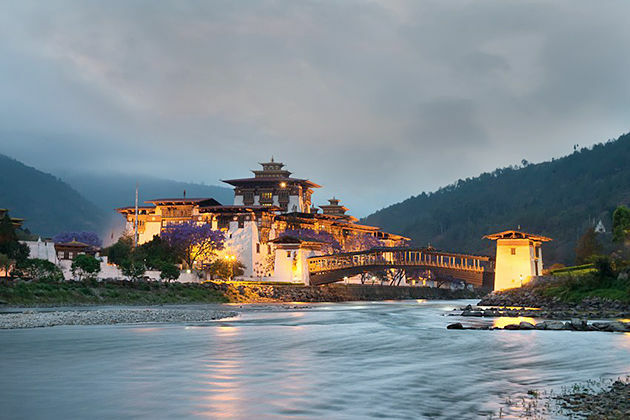 Exploring extraordinary Bhutan – the landlocked kingdom of majestic landscapes, mythology and cultural diversity. Once visiting this magical country, how can we miss the opportunity to buy the best Bhutan souvenirs to keep the spirituality of this Buddhist country besides us forever? 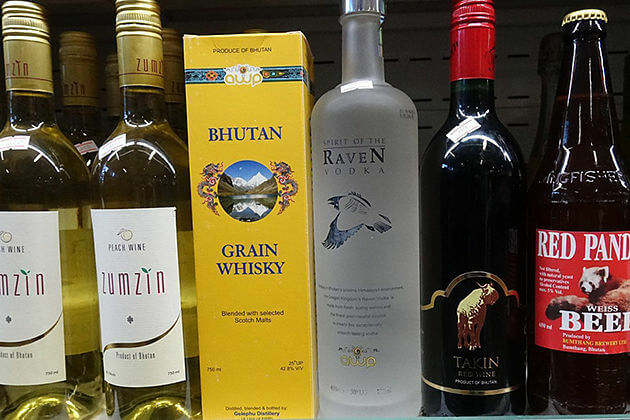 Although the Government maintaining their country untouched, there are myriads of things to buy for travelers when visiting Bhutan. However, we should notice that Thimphu, Paro, and Jakar (or Bumthang) are major shopping centers in this remote country. Upon the local market, you will absolutely indulge in various types of traditional souvenirs such as handicrafts, weaving products, red rice, jewelry, textiles and so on. Head for the list and follow the tips below to find out what is the best thing to buy and where to buy Bhutan traditional souvenirs during your Bhutan vacation. Canes and bamboos are widely used to make many items for the daily life of Bhutanese people. Since the Government opened their country to travelers around the world, items made of cane and bamboos are popular gifts to tourists. These items are small and valuable to buy such as baskets, wall-hangings, carpets, mats and so on. 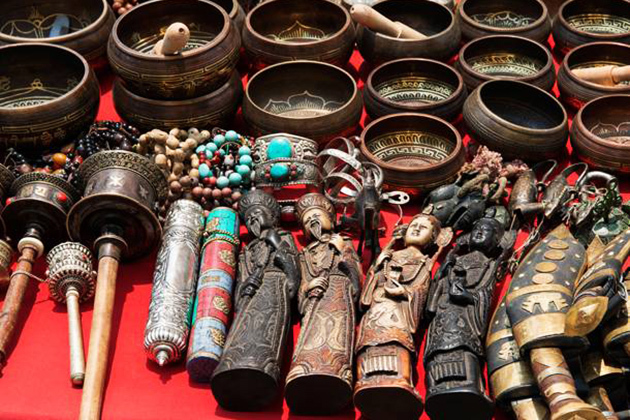 With myriads of shops selling these items, Thimphu is an ideal place to buy the cane and bamboo products. The ancient art of woodcarving has existed in the Bhutanese society for a long time passing through generation to generation and now plays a vital role in Bhutan culture. 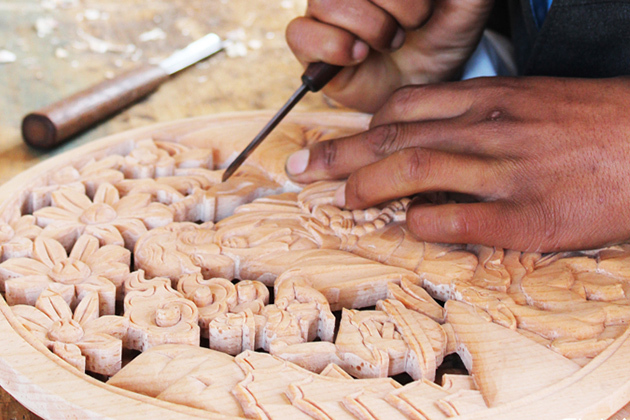 Through skillful artisans, different shapes of wood become exquisite products and decorate items such as bowls, cups, plates and with unique shapes and colors. They are widely used in the daily life of the Bhutanese people and now is one of the most favorable souvenirs for the tourists traveling to Bhutan. This type of gift is sold in many shops throughout the country. Festivals play a vital role in the culture as well as the spirituality of Bhutanese people reflecting the deep inheritance of Buddhist religion to the country. The dance festival is believed to has a significance to people’s soul, by watching these dances, it is thought to help to purify their mind and bring them good luck. It cannot be ignored that masks hold a crucial part in any festivals taking place throughout the country. 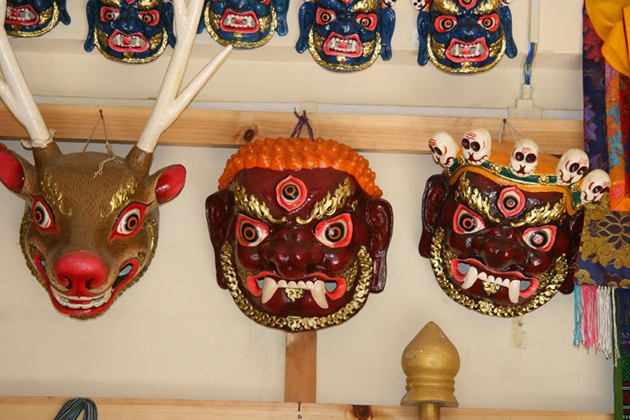 Dating back around the 8th century, Bhutanese masks are generally made of wood, carved with different shapes of the face and decorated by colorful fabrics mix with Bhutan traditional dress of the performers in dance festivals. 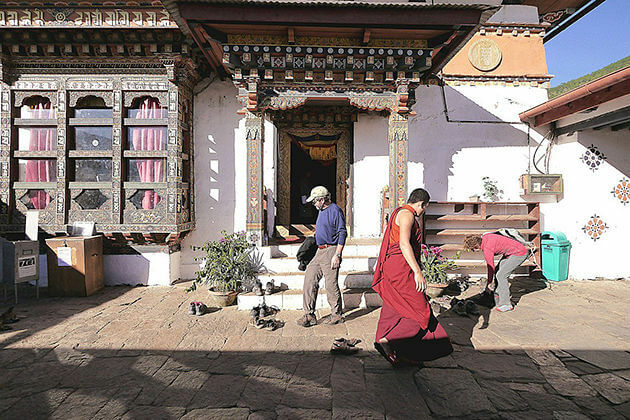 Thimphu, Paro is an ideal place for visitors to purchase the items with affordable price. Bhutan is incredibly wealthy with abundant vegetation and herbal medicine from that dying materials are extracted to use for dying textiles to make stunning colors and floral patterns by traditional methods using various types of natural ingredients such as leaves, roots, tree barks or flowers. 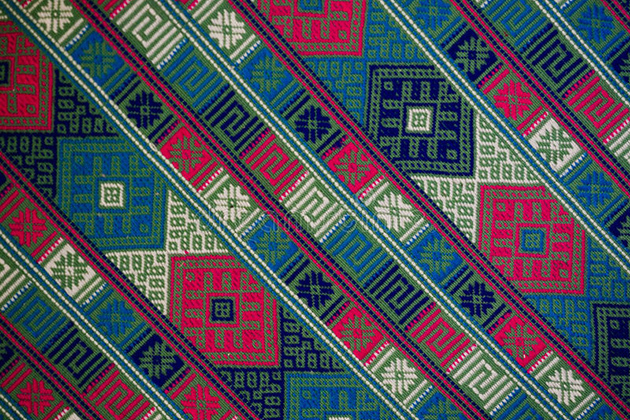 Bhutanese weaving (or textile) is the unique art of the country features with intricate designs made entirely by clever Bhutanese women. After having been processed, the textiles are used to make crafts, bags, wallets and especially clothing like Gho and Kira. 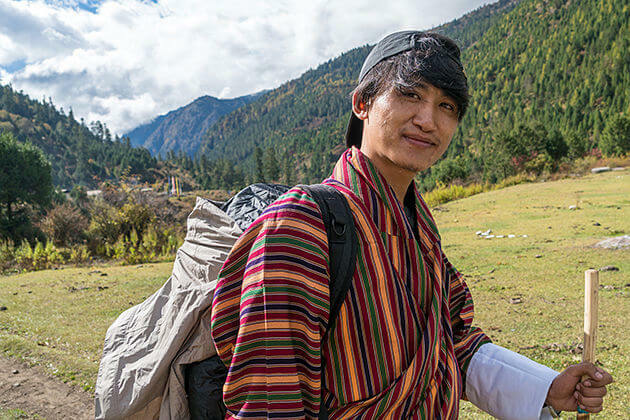 Spending time to explore the textiles hubs in eastern Bhutan like Bumthang, you will be able to buy the authentic local products with a low price that is hard to find in other places throughout the country. Like other countries in Asia, agriculture plays a significant role in Bhutan’s economy. 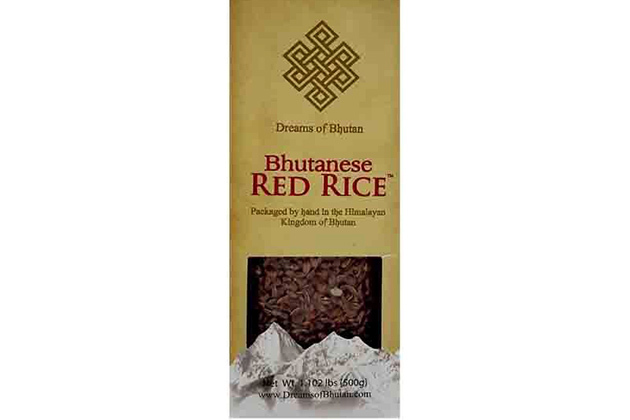 One of the main crops in Bhutan is rice and especially red rice. It is medium grain rice, which is grown in the fertile valleys, containing various types of nutrition such as vitamins and minerals. Once visiting the kingdom of thunder dragon, why don’t take the chance to enjoy and purchase this unique staple food of Bhutan for your acquaintances? It is sold widely in the local market of the country. Buddhism has great significance in the spiritual life of Bhutanese people. It is not just a religion, it is the norm of people’s behavior. Naturally, it is depicted in the art of painting using mineral paints to decorate the temples or houses. 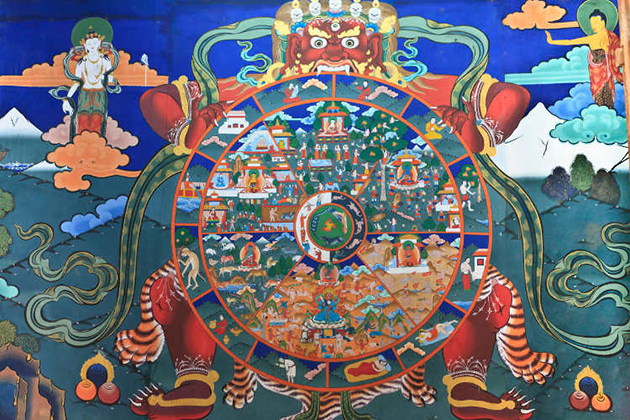 A suggestion for art lovers is that Thimphu is an appropriate area to look for this unique item. Ornaments and jewelry are essential parts in traditional costumes of Bhutanese women. 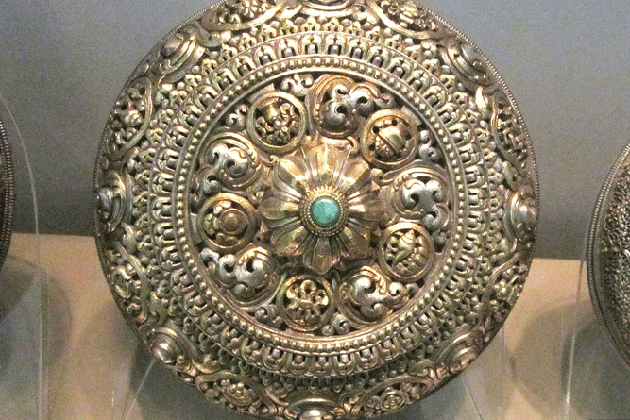 With various precious ingredients such as gold, silver, bronze through skillful experts to make intricate accessories featuring the Bhutan unique art. These beautiful ornaments are worth to buy and use for special events. Thimphu and other major towns are the shopping hubs to buy these items. Bhutan is an ideal destination for philatelists around the world. 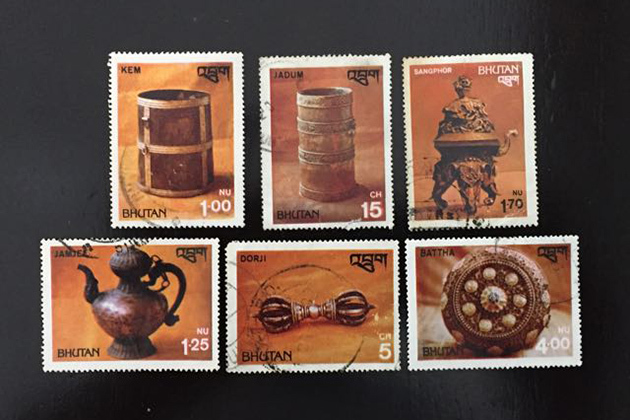 With the first postage stamps issued in 1962, so far, Bhutan postal stamps have made with different shapes with unique designs, bright colors and lively picture making it become the great souvenir to buy in Bhutan. The Post Office is considered a favorite area to collect this unique item. 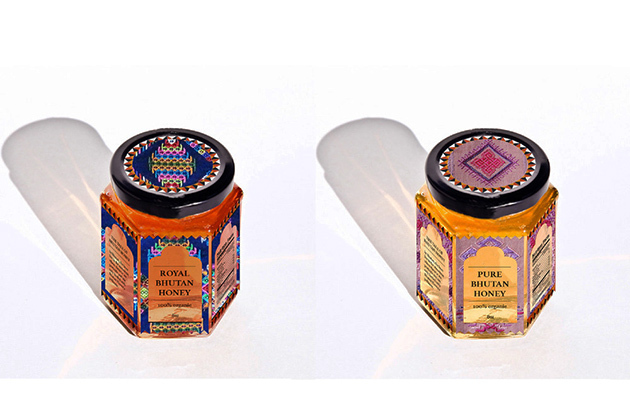 With over 70% area covered by vegetation, Bhutan pure honey is one of the treasures which is given by nature. It is widely known for the natural benefits as well as containing antioxidant compounds. Hence, that would be the valuable thing to buy when visiting Bhutan. 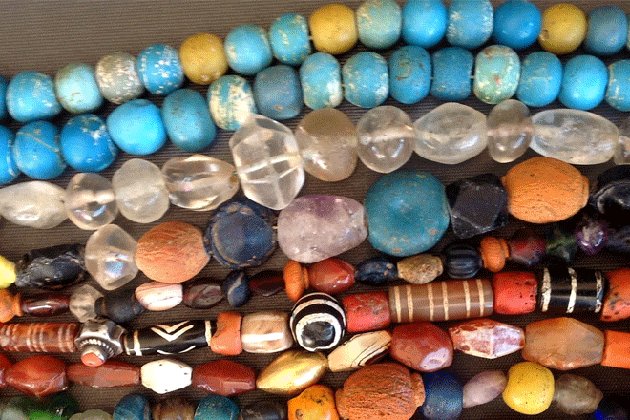 The Himalayan Beads (or Dzi Beads) are used to make necklaces and bracelets for people in Bhutan. It is commonly believed that bring up good fortune for people and ward of the evils. The beads are made from agate with different sizes, shapes and symbols contributing to the abundance of good things to buy in Bhutan. Bhutanese traditional paper plays an important part in the long-lasting culture of the country. 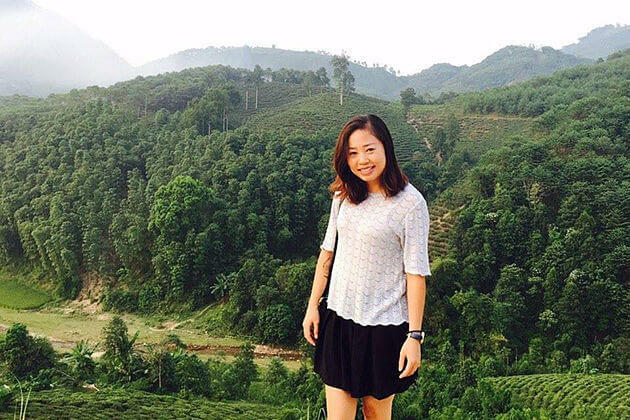 The process of making people does not belong to any ethnic groups but it is established by the Government to provide the pattern for Buddhist monasteries and painting industry. With the variety of functions such as gift wrapping, greeting cards and so on, it has been a favorite present for tourists traveling to the kingdom. Souvenir is something obligatory whenever people pay a visit outside or within their own country. Coming to Bhutan, people will surely have a chance to bump into manifold adeptly authentic handicraft that, somehow, lead them to become shopaholics without any awareness due to its features of traditional values. The point is how those travelers can choose themselves some of the best Bhutan shops where converge these wonderful souvenirs? The following “Top 5 places for shopping in Bhutan” will be your answer to this question above. The main artery of the city’s capital, Thimphu where travelers can literally indulge themselves in the street of traditional handicraft and artwork. If you do not want to buy things, you can just simply get into the view of the street. This hustle and bustle street starts welcoming tourists at around 8:30 am to 9:00 pm. Handmade souvenirs here are amazing, however, they are expensive, also, textile shops can be found in this market. This series of bamboo huts showing a wide range of authentic Bhutanese Arts and Crafts, is just adjacent to the Norzin Lam, right opposite the Nehru Wangchuk Cultural Centre. Many handmade things as crafts, bags, shoes and so on, all can be found at about 80 stalls stretching nearly half a kilometer with varied designs. These stalls open at 10:00 am and close at 6:00 pm. Coming to the country’s oldest bookstore, situated in the first floor of Jojo’s Shopping Complex in Cham Lam, tourists can immerse in a great collection about the Himalayas, Bhutanese people as well as fiction and non-fiction books, or even religious books like Buddhism and Hinduism. 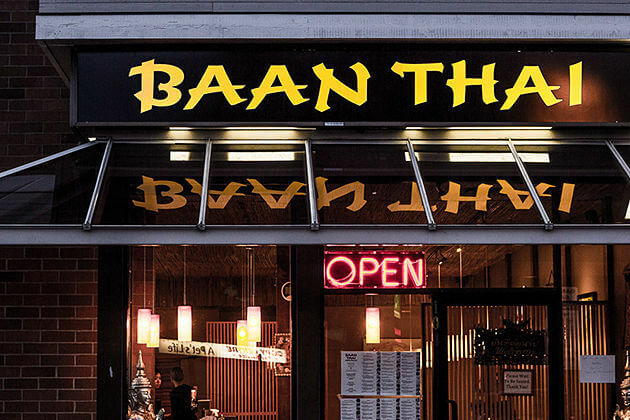 This shop is neatly laid out and staff is well-trained and really helpful in the cases that you get lost here. Another place where masks, thangka, painting or other traditional stuff can be found. This amazing collection of souvenirs come from affiliated Choki Traditional Art School. For one who has a passion for handmade stuff and wants to experience creating one of them, this place is a well-worth destination. One of the best Shopping Complex in Bhutan that you surely have a great experience during paying a visit here, especially for one who is a shopaholic. Basically, along with traditional stuff like handicrafts, Bhutanese clothes… people can also find some high-quality products which are imported from Nepal, Thailand, and Dhaka. Everything being sold here is delicate and gorgeous. When shopping in Bhutan, bargaining is considered very unusual. Sometimes the seller would give a discount when more than one item is bought. You should be careful when selecting the present to buy to ensure it will not be seized by the customs on departure. Bhutanese bows and arrows are one of the special gifts in the list of amazing Bhutan souvenirs. 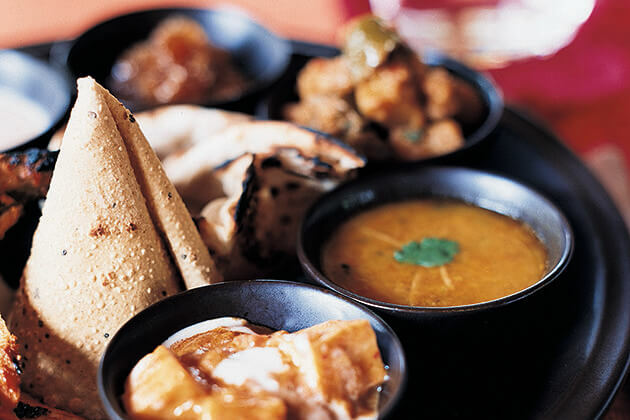 Dating back to many centuries ago, it has a significance to Bhutanese people in the past as well as the present. However, whenever you decide to buy this item in Bhutan, please ensure that it is allowed in checked luggage when you travel to your country.